Your brand is your promise to your customer it's much more than your logo, it has a presence on its own, it’s everything you and your brand stand for. You want your brand to speak in one voice over all your audience touch points, every logo, banner images, image vibe, colour tones, fonts have to give the same message to your client. 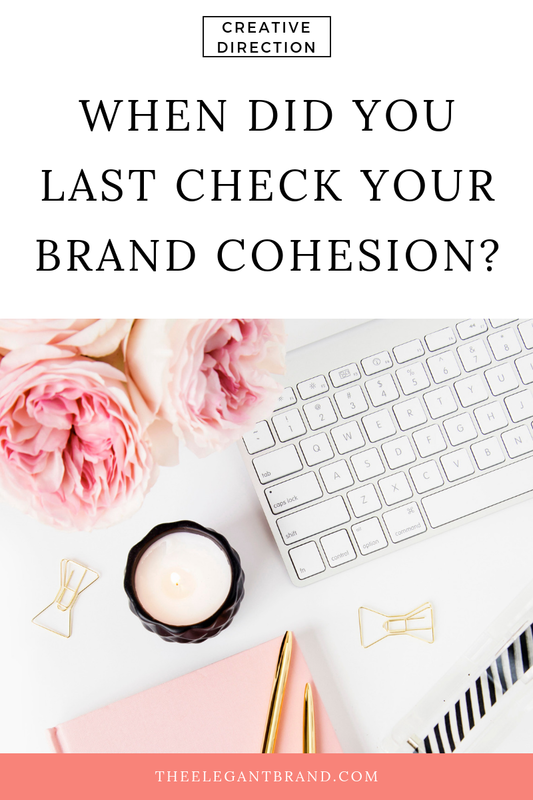 When you launched your brand, this wasn’t on your priority list, slightly overwhelmed by all the touch points a client could come across your brand you just put something out there. There’s a lot when you think about it, Facebook, Pinterest, Instagram, Twitter, website, blog. It’s entirely reasonable that some of your graphics, images profiles, don’t fit your brand anymore as you had a lot on your plate when launching. Make this year, the year where you get more strategic. Instead of thinking as a small business, think big, get yourself organised to free more time for yourself. (read more about batching content creation in last’s week blog post). This week let’s continue with more strategy and look for brand cohesion overall brand’s touch points. Before we start, I would recommend making some choices, streamlining and cutting the chase so you can be even more focused and serve your audience. I want you to look at your social media, is it really worth having an account with all the social media platforms? Look into your statistics, engagements, you might quickly find out that unless you pay to get engagement on your facebook page the numbers have dropped dramatically. Is it just your ego telling you, you need to post on facebook, on Linkedin, Instagram, Snapchat etc? Where is your audience? What appeals to you most? It can be disheartening to discover that you’ve reached about 100 people on facebook with your blog post but only three of them engaged. This means that It might be time to refocus your efforts elsewhere to get results. I am not telling you to get rid of your Facebook page as you need one to have a business account on Instagram, and Facebook ads can be a powerful tool, put it at a lower position on your priority list, don’t spread yourself too thin, work strategically. Focus on the social media where you get the most engagement, not followers you want engagement. Start looking at Pinterest as a way to drive traffic to your site; it surely is the next big thing in driving traffic to your site. To my surprise I get more traffic from Pinterest than Instagram! Once you’ve selected the social media and touch points, you want to focus on, make a list. Take your brand styling kit out, if you haven’t got one here is some help how to create one. From your list filter your branding style guide against each of the social media you’re on, website, lead pages etc. Check for links that are outdated or don’t work, be ruthless. Make sure you give a cohesive image of your brand, delete old profile images, check for colour tones, mood, emotion, content, story, does everything work in harmony? If it looks confusing, non-relevant, delete, upload new images, create new banners if needed, change fonts if they are in a different style. It might take you some time to work on streamlining and creating a clean image of your brand it will be so worth it, you will not only come across as professional, trustworthy, your audience will also recognise your brand wherever they find you. Remember it takes 7 times for someone to get accustomed to your brand so you’d better wowed them each time!